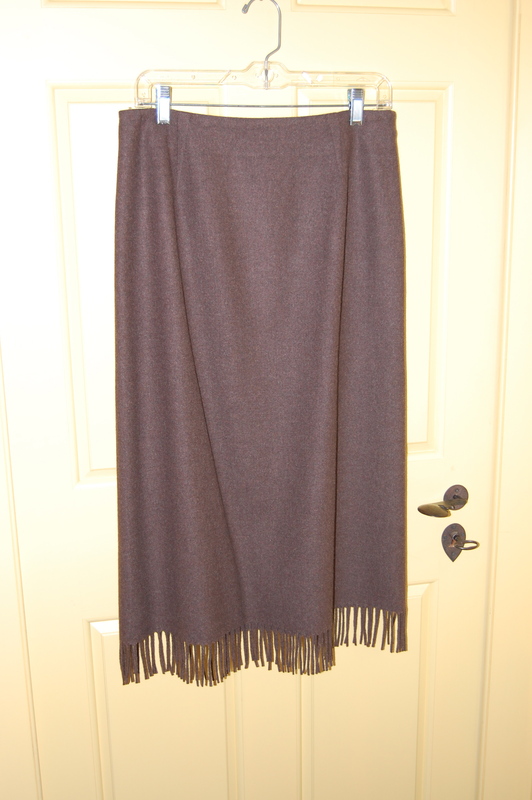 A number of years ago I purchased a fringed skirt from a Pendleton Wool Women’s Apparel catalogue. 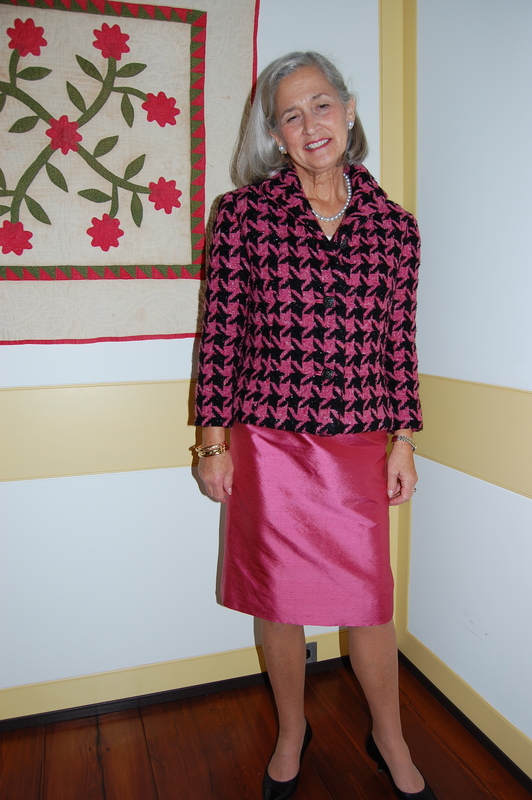 I loved it when it arrived at my door – the fabric was soft and beautiful and the styling was a simple A-line skirt. Even though I ordered a Petite in my regular size, I should have sent it back for a smaller one; it was just too baggy and too long, even when paired with boots. The skirt before it’s make-over – very baggy. First I took out the zipper. 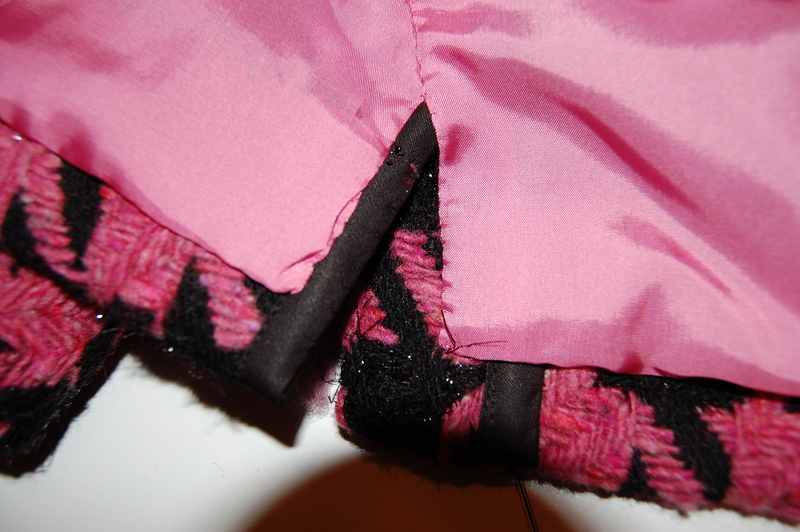 Then I picked out the seam connecting the waist facing to the body of the skirt. I set the lining/skirt facing sections aside and tackled the skirt. 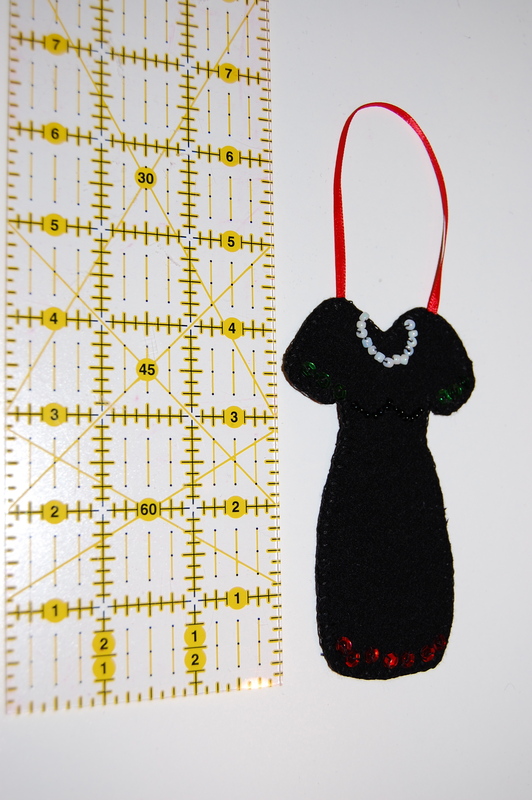 I had to determine the exact length I wanted the skirt to be, and work up from there. 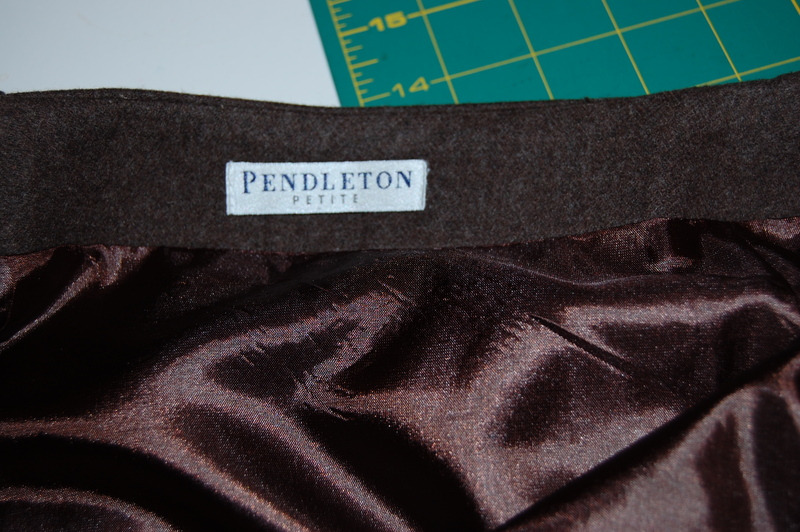 Since it was not just length that needed to be adjusted, but also the all around fit, I knew I needed to use a reliable skirt pattern to re-cut the front and back sections. I was so happy with the fit of the slim skirt I had just made, that it was an easy decision to go with that again. 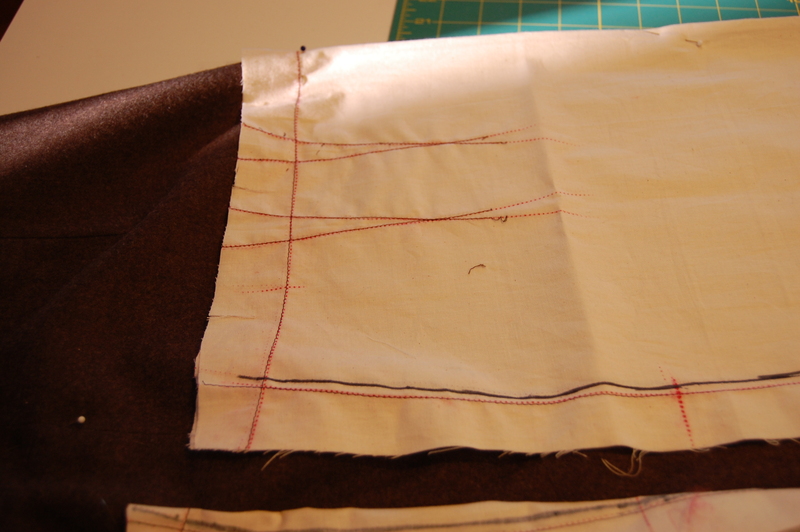 I determined the straight grain of the front and back sections and put the muslin sections on top. 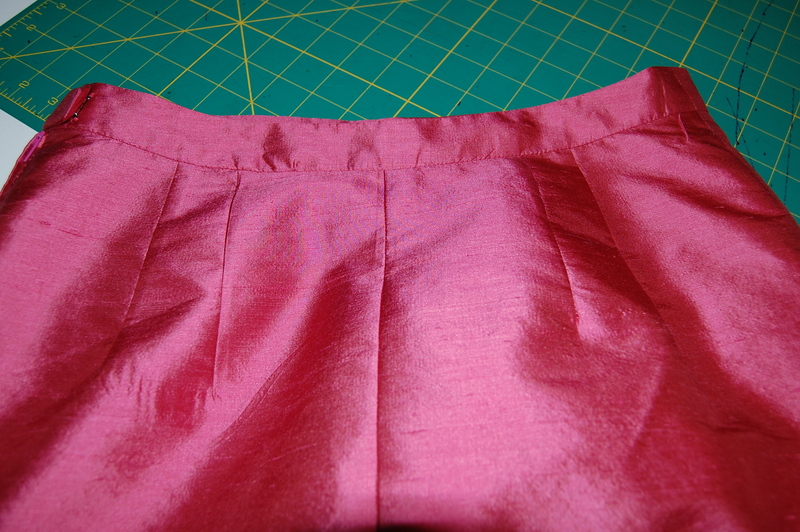 The muslin pattern placed on the front and back skirt sections. Making sure I have the finished hemline placed correctly. Since this skirt would not be underlined, I had to transfer the new seam and dart lines with chalk directly onto the wool fabric. I measured again and again to make sure I had the right length (since I certainly could not make adjustments to the fringed end!) 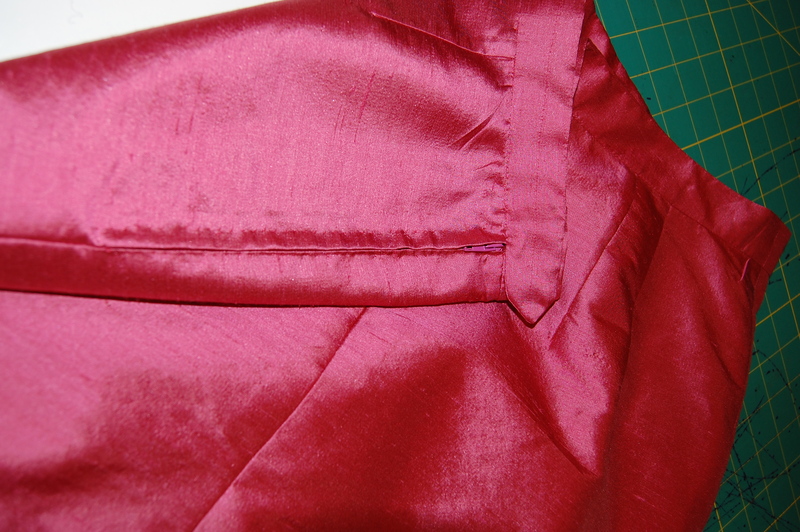 Then I cut, sewed darts and side seams. I put a new zipper in by hand. Then I was ready to remake the lining. This was simpler, as I could use the existing waist facing (just taking it in a bit), which was still basically attached to the lining, and work from the top down. 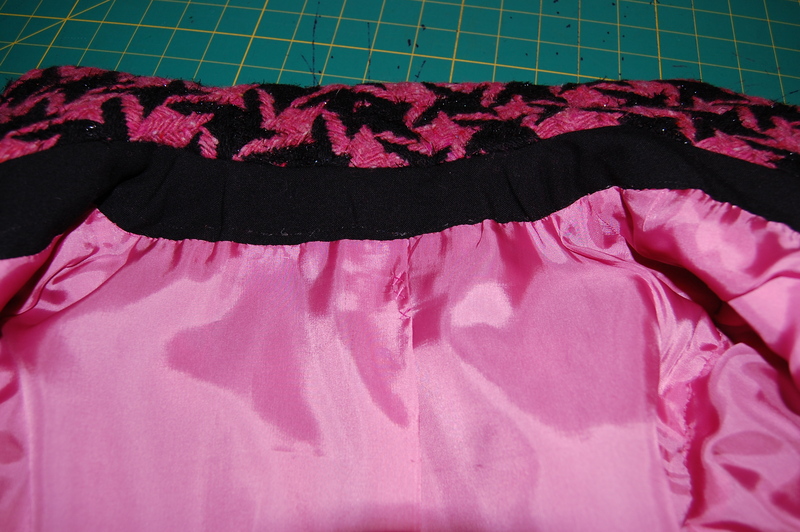 I split open the side seams, took them in commensurate to the re-cut skirt front and back, and re-sewed them. Once the facing was reattached, all I had to do was cut off and re-sew the lining hem, and then slipstitch the lining around the zipper. The re-made lining back inside the skirt, label intact. I am so happy with this re-make. It’s the perfect skirt to pair with a sweater and tights – and that fringe around the hem makes it fun to wear and just a step above the commonplace. 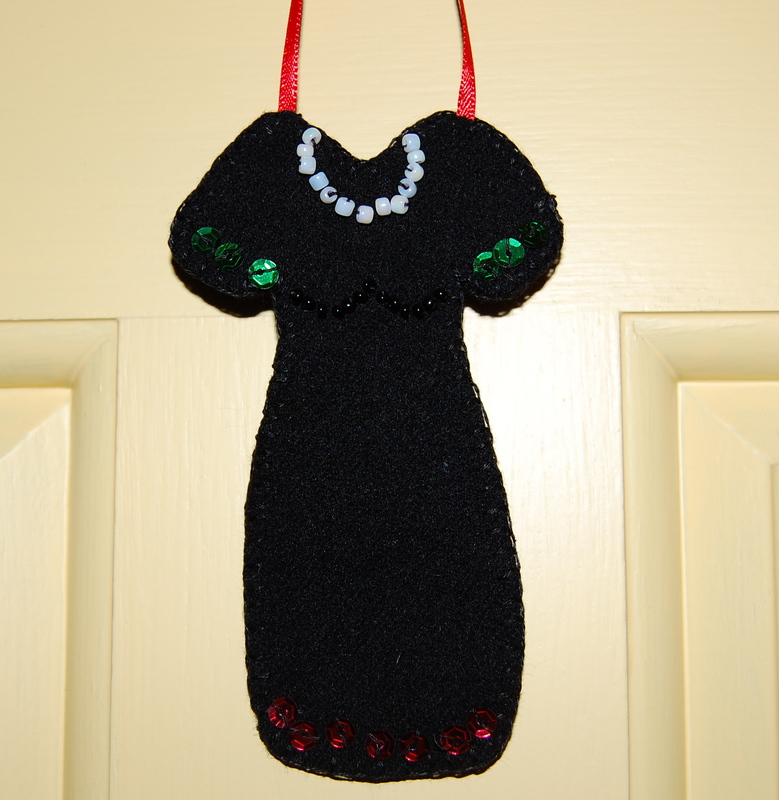 POST SCRIPT: I’m delighted to say that Cissie is the winner of my first give-away – the very small Little Black Dress. 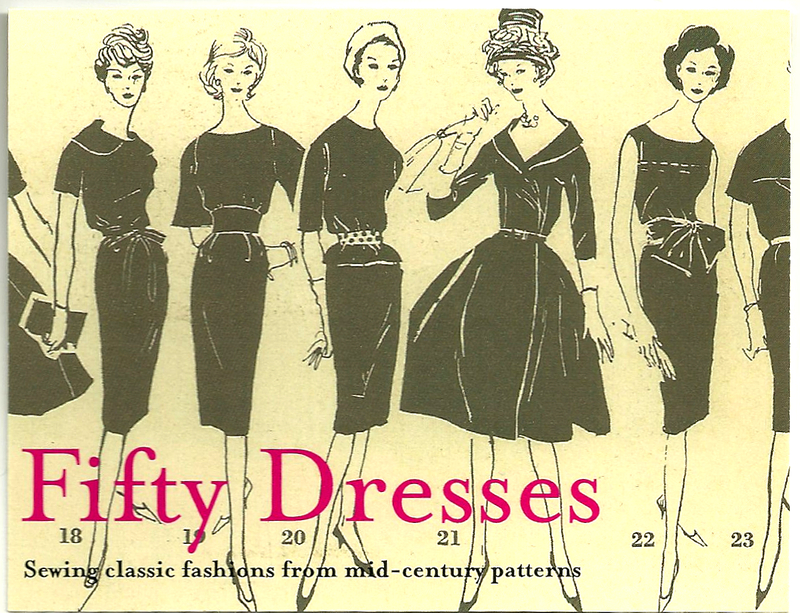 Cissie – please send your delivery information to fiftydresses@gmail.com and I’ll get your very small package in the mail right away! Last week, as I was putting in some final hours on a suit I have been sewing, I was thinking about some of the “creative” solutions I had to come up with to make the jacket turn out successfully. I had, unbeknownst to me, made a “bad” decision about the fabric. 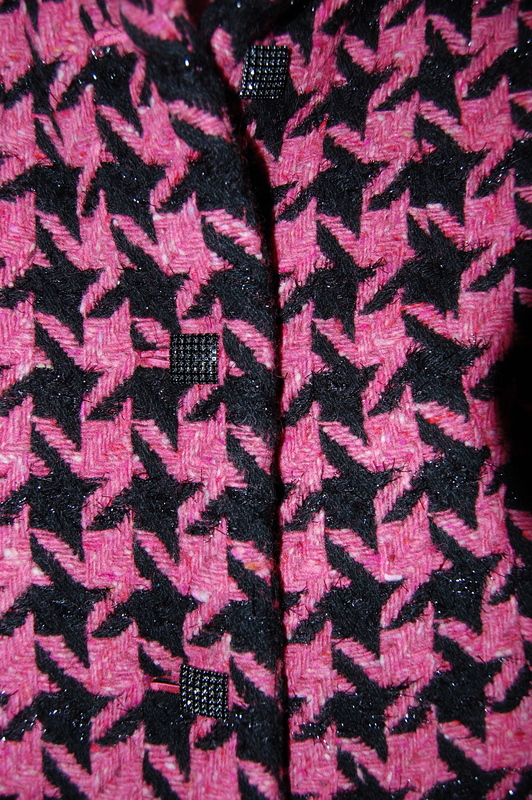 Even though I (still) love the color and design of the black and pink hounds-tooth wool blend, it turned out to be a very heavy, bulky fabric to sew. Well, my newest Threads magazine arrived in the mail last Friday – and right there on page 56 is an article entitled “Better Sewing Habits”. 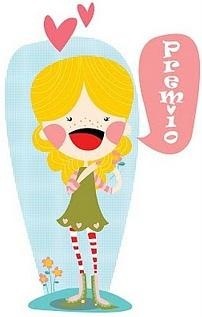 Number 4, by Claire Shaeffer, is: Choose fabrics appropriate to the garment design. Printed in bold is this line: “Select a fabric that is recommended for the pattern”. 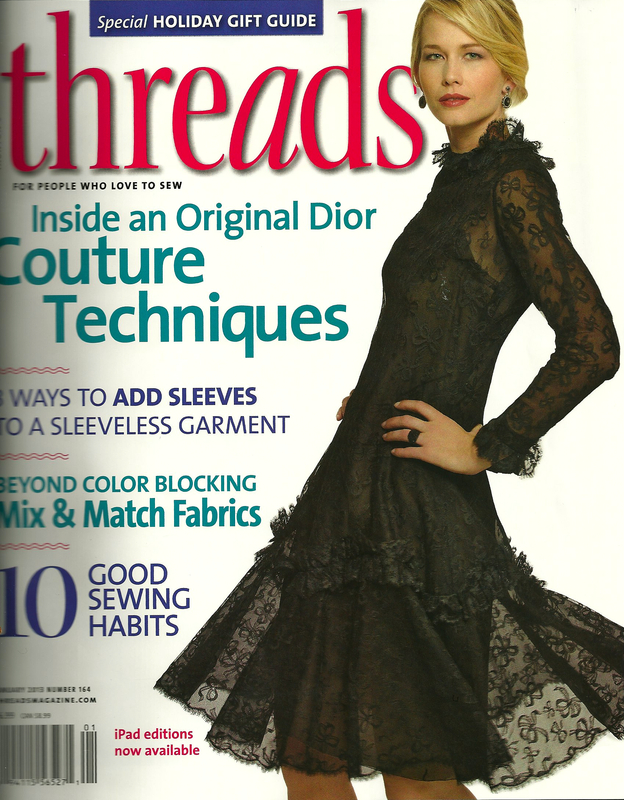 This issue of Threads is packed with all kinds of great advice and ideas! Sure enough, when I went back to the pattern envelope, there in plain English for the recommended fabrics is: “Lightweight wool.” I really felt that sinking feeling, but I tried to console myself by reminding myself that I had made some changes to the pattern and to the construction to accommodate the heavy fabric. I was trying to feel grateful that I actually have some skills which allow me to make changes and try different approaches to solve sewing problems. And, actually, now that the jacket is finished, I am happy with it. 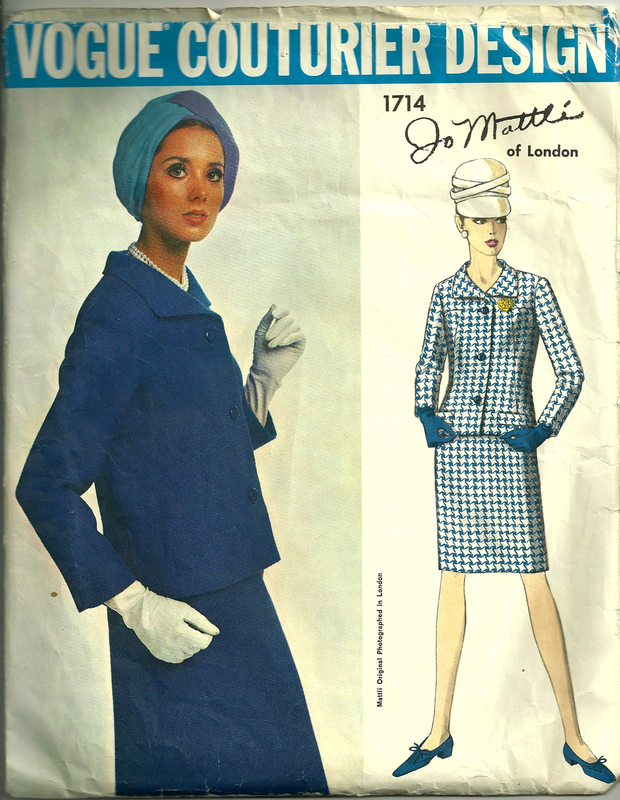 This is the pattern I used – from Vogue’s Designer series, Jo Mattli, circa early 1970s. 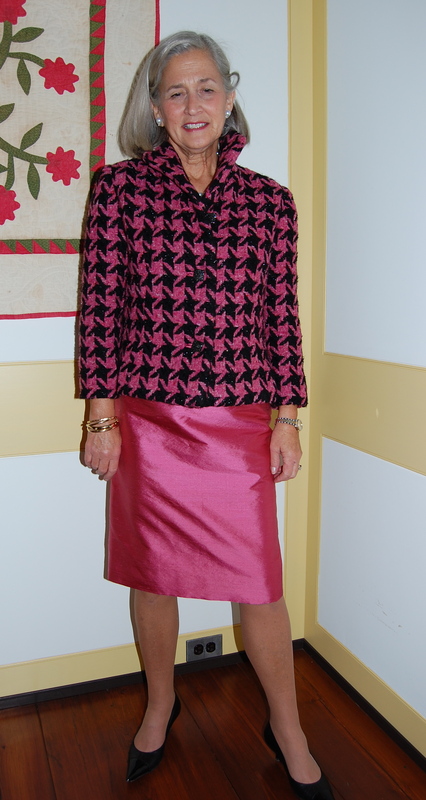 The completed outfit – wool blend jacket and silk skirt. 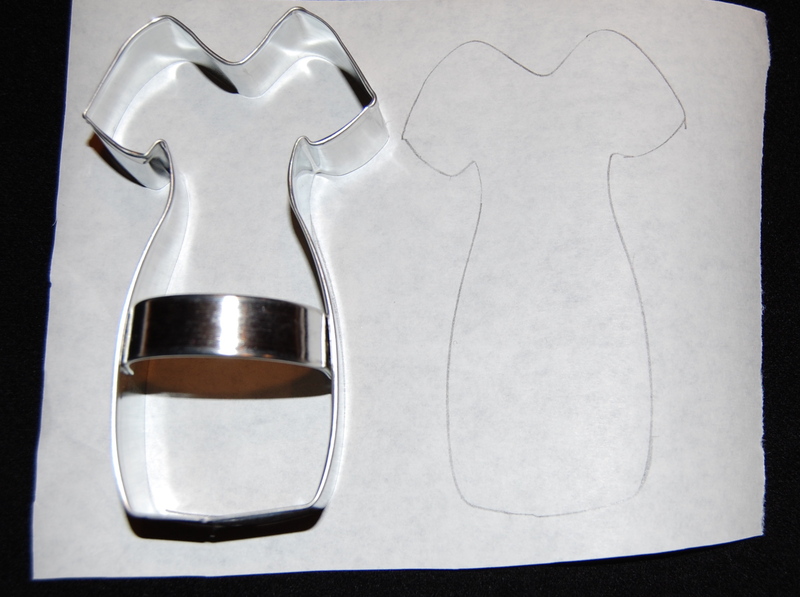 1) I was able to match the design quite well across seam lines, shoulders, and sleeves. 2) I think I nailed the fit! Of course, I made a muslin first, so it’s not like that just happened. 3) I reduced the spread of the collar, which actually turned out to be a good decision, when I realized how difficult double layers of the fabric were to work with. 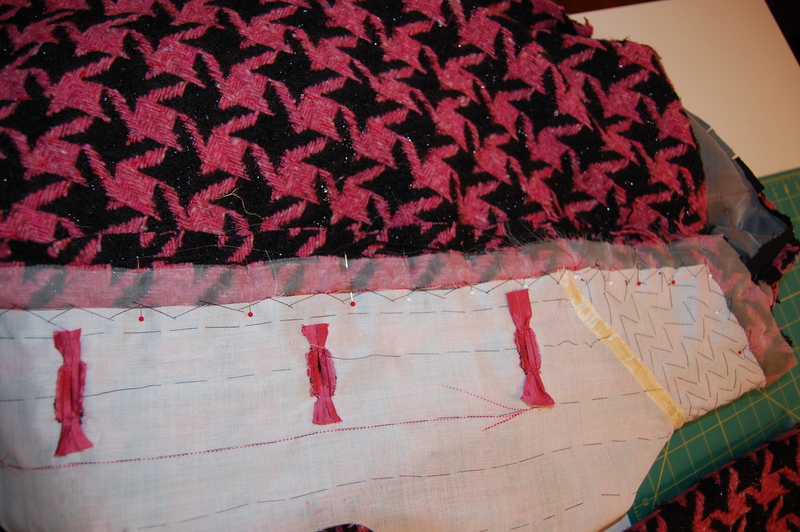 1) I really wanted to make bound buttonholes, but the loosely woven, heavy fabric gave me pause. So I decided to make them out of the silk skirt fabric. I backed the buttonhole strips with silk organza by fusing them together. This made the silk stiff enough to stand up to that heavy wool. 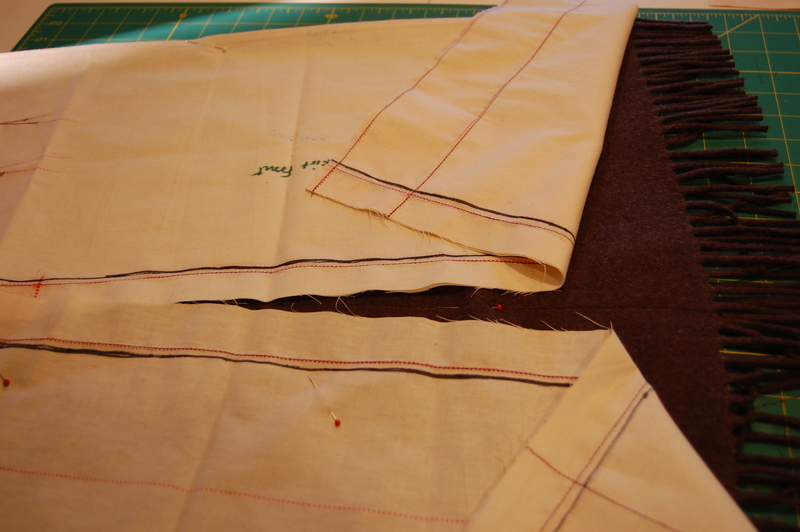 The strips attached for the bound buttonholes. I made the topmost buttonhole a “blind” one as I determined that I would not be buttoning that top button anyway. 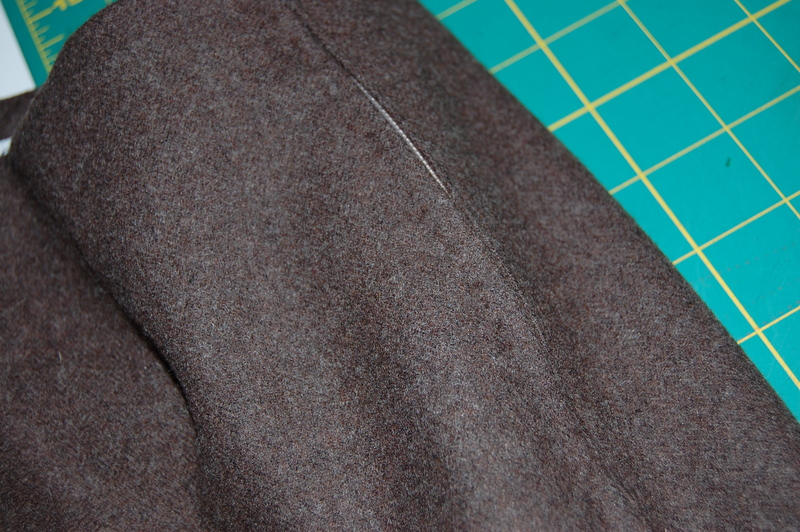 I knew I could never finish the back of the two remaining buttonholes by the normal method, so I “patched” behind them on the interfacing with a lightweight black wool. Here is a close-up of the bound buttonholes – and the happily matched front! Click on the photo for a closer-up view. 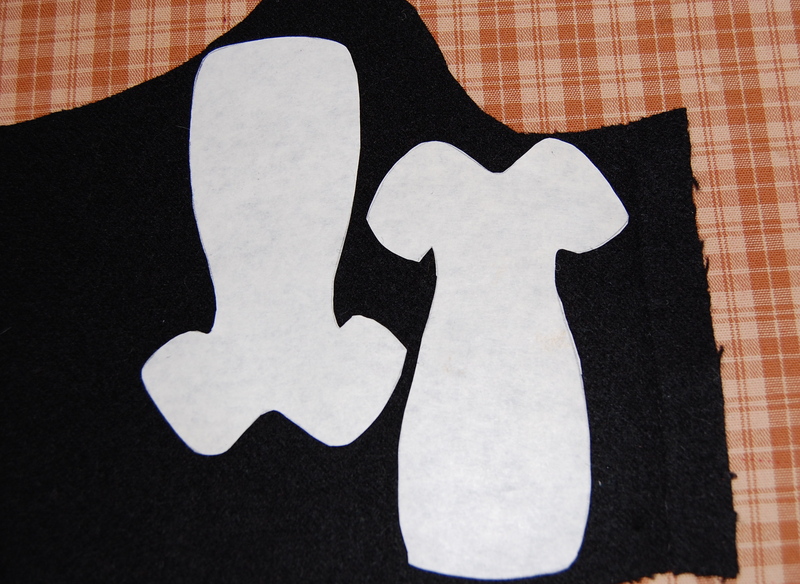 Before I sewed the front facing, I attached these “patches” to back up to the buttonholes. Then I cut away the heavy fabric underneath, so that I could finish the underneath of the buttonholes somewhat successfully. Click on the photo to see this up close. 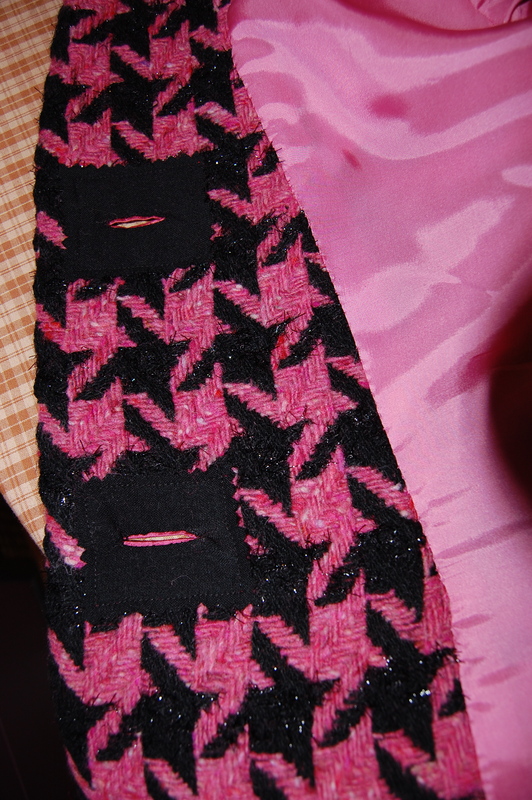 2) The neck facing was going to be too heavy using the pink/black wool. 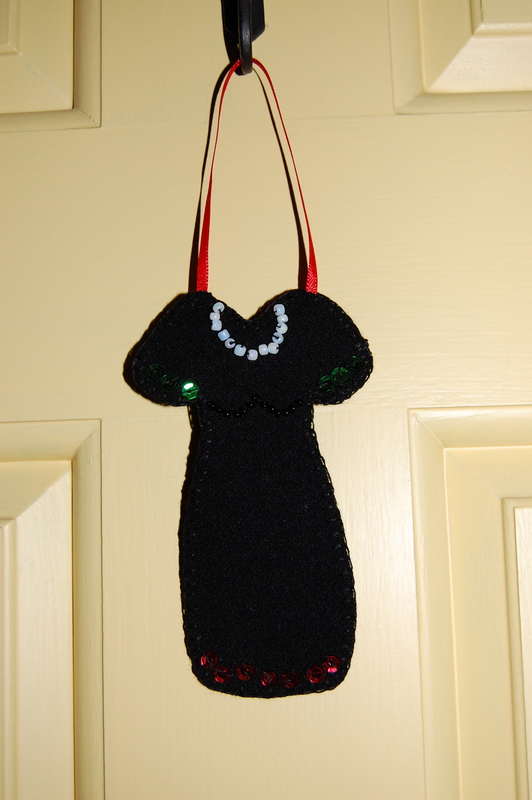 So I used that same lightweight black wool for it instead. 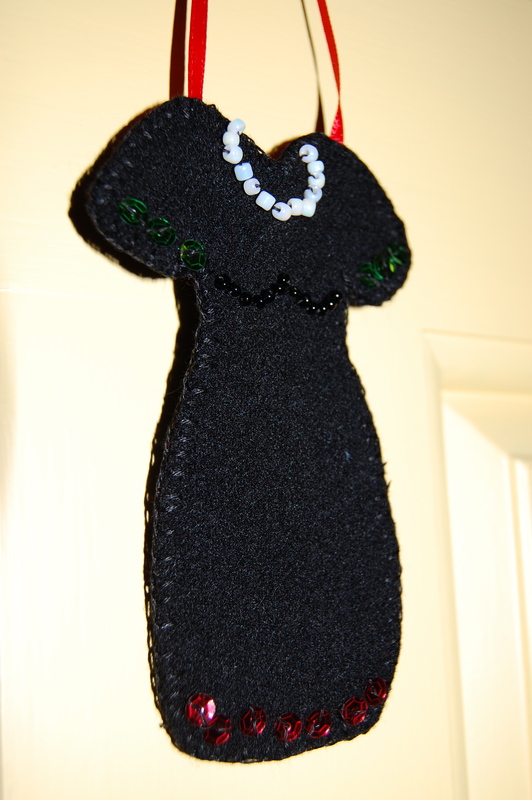 Using a lightweight black wool for the facing made the neckline much more manageable. 3) The back vents were not going to lay flat if I turned in the raw edges as the pattern instructions indicated. So I bound them with black bias tape instead. Instead of turning back the facing edge to finish it, I attached this bias binding. 4) Setting in the sleeves was an exercise in sewing terror! I was sure they would never look good, but somehow they came out unpuckered and pretty well matched. I only used a sleeve heading to round out the shoulder, even though the pattern called for shoulder pads. 5) I have steamed and steamed, but still feel like the front edge could use some further attention. I might take the jacket to the dry cleaners and have it professionally steamed…. I actually really liked the engineering of the pattern: with the correct weight fabric, the jacket would go together quite well and the skirt pattern is a winner, with its shaped waistband. This view of the back waistband shows how it is shaped. And, of course, I inserted the zipper by hand. Another look at the finished suit. Interestingly enough, in the same issue of Threads, the winners of the “Make it with Wool” contest were featured. 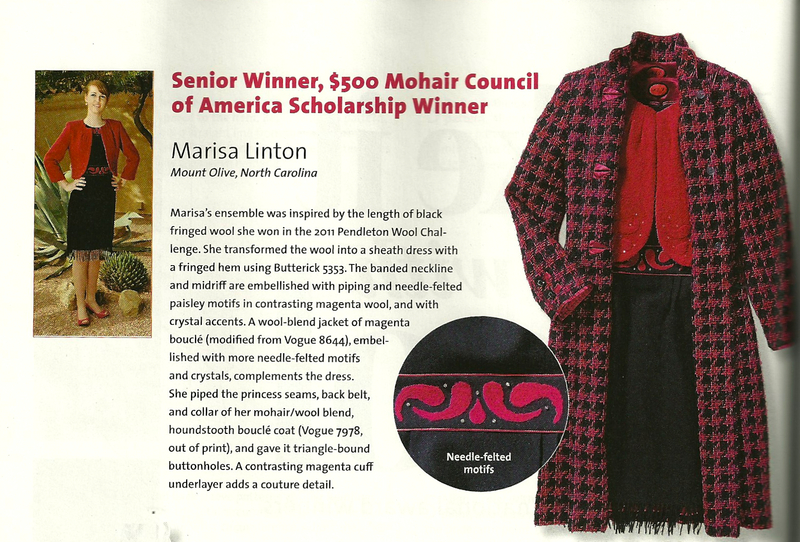 I couldn’t believe my eyes when I saw that the Senior Winner of the Mohair Council of America, Marisa Linton, of Mount Olive, North Carolina, had used either the same fabric or one very close to “my” fabric to make the coat for her entry (which is stunning, I might add!). She had used a very original and successful technique for her buttonholes, which are part of the details which make her outfit so noteworthy. So – it seems the past 7 days have been a time of many arrivals, including a huge and destructive East Coast storm – and the first day of November. May the next 7 days bring the final arrival of power and comfort to so many who lost so much in the storm, and make us all grateful for resilience, whether it be in life – or in sewing .